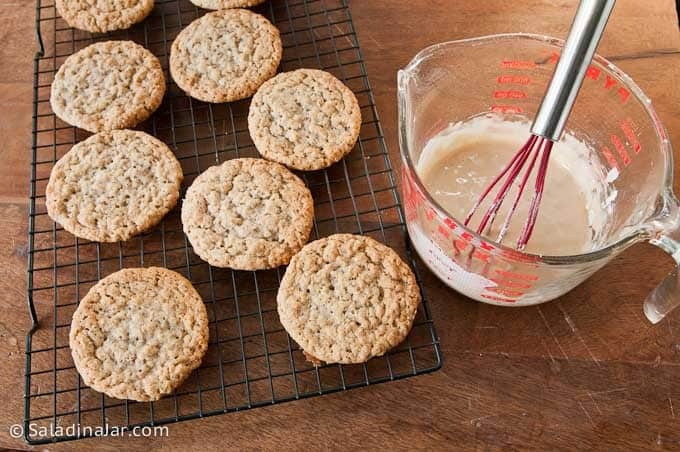 Iced Oatmeal Cookies are thin, crispy, and chewy. In addition, a delicate layer of coffee-flavored icing guarantees they will be a hit with the whole family. My husband declares them his favorite. Have you ever wondered what makes a cookie popular? 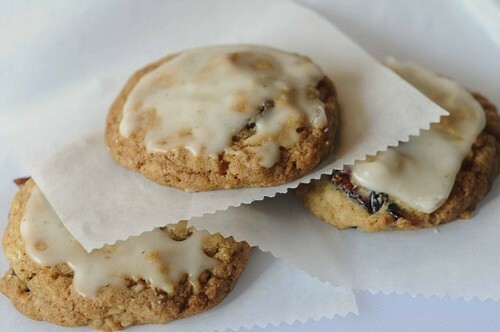 If I had a signature cookie, it would probably be Iced Oatmeal Cookies. These cookies seem to fly out of the cookie jar. Although it’s just my guess, I’m thinking it has something to do with the light coffee-flavored glaze on top. Everybody seems to love cookies with frosting on top–or is it just me?! Next to Thumbprints, these cookies are my husband’s favorite. Since I only do thumbprints at Christmas, he requests and gets these oatmeal cookies more often than any other. 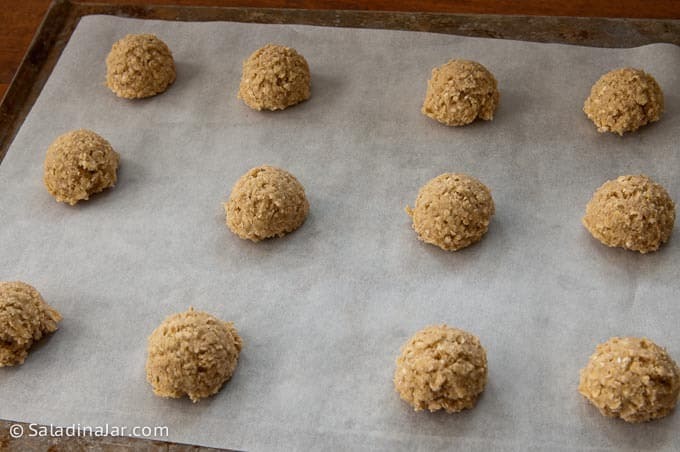 Iced Oatmeal Cookies will rise up in the oven. But don’t be surprise when they fall in a dramatic fashion soon after they are removed from the oven. No worries! That’s expected and normal. Straight out of the oven, these cookies are crispy. Nevertheless, they will soften a bit the longer they sit around. Ice them with coffee-flavored icing or try browned-butter icing. Try replacing the coffee with milk or cream. Moreover, plain white powdered sugar icing will suffice. For variety, try adding raisins or dried cranberries. If you go that route, I recommend nixing the frosting. Frosting plus raisins equals a lot of sugar in my book. However, my husband sees the whole sweetness matter differently. After all, he is the authority. Sorta. Regarding these cookies anyway. How did you get the dough balls the same size? Using an ice cream scoop will give you pretty, uniform cookies. Be sure to leave plenty of room on the cookie sheet. Typically, these cookies SPREAD! This recipe adapted from Among Friends with Heart & Soul. 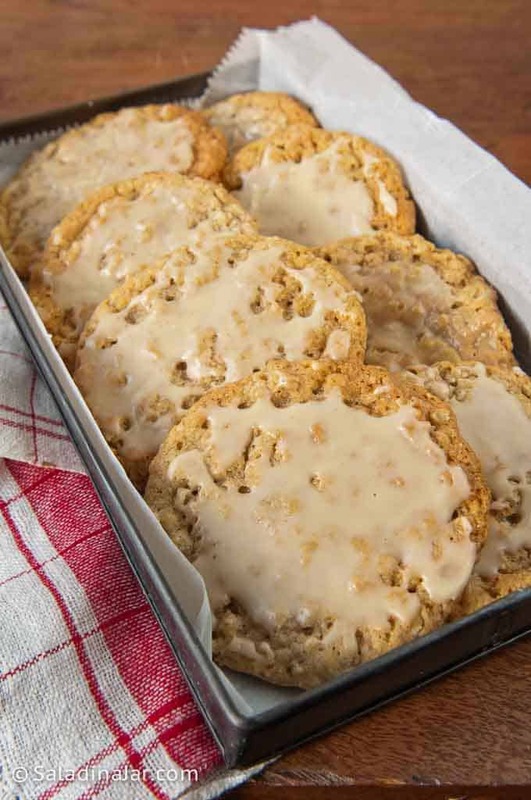 “Iced Oatmeal Cookies” was originally published as “Chewy Oatmeal Cookies with Coffee-Flavored Icing” in January of 2010. 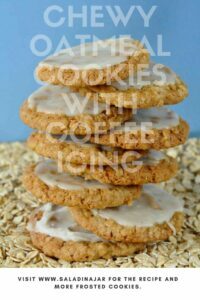 The recipe and pictures have been updated along with a new video showing how to make Iced Oatmeal Cookies. 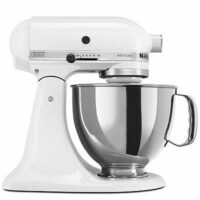 Whip butter until smooth and creamy. Add sugar and continue beating until well mixed. Add eggs, honey, and vanilla and mix well. Whisk together flour, cinnamon, baking soda, and salt. Add to butter mixture. Stir in oats. Drop onto cookie sheet by teaspoonsful. They spread a good bit, so leave plenty of room. Bake at 350 degrees for 11-13 minutes. Combine sugar with black coffee and mix until smooth. You may need to add more liquid to make glaze spreadable. Browned-Butter Glaze is also delicious on these cookies. Thanks for the heads-up. I think all is well now (but let me know if not). Enjoy the cookies. I make these cookies with butterscotch chips added to the batter and my family loves them. This is everything I have ever wanted in an oatmeal cookies. Perfection! Thank you. So glad you liked them Maggie. After your comment, I promptly made a batch because you reminded me how much we like them, too. Paula, you did it again! These cookies are the best! And wow, browning the butter adds an interesting dimension to the icing. My family gobbled them right up. Every recipe I’ve tried from your site has come together beautifully and been delicious. Thanks so much. The recipe also does not include when to add the honey- I assumed it was with the eggs and vanilla. Nor does it say when to add salt- again assumed it was with the other dry ingredients. Hi. I’m from Portugal and sometimes it’s hard to find (outside the big cities) the stuff you talk about. 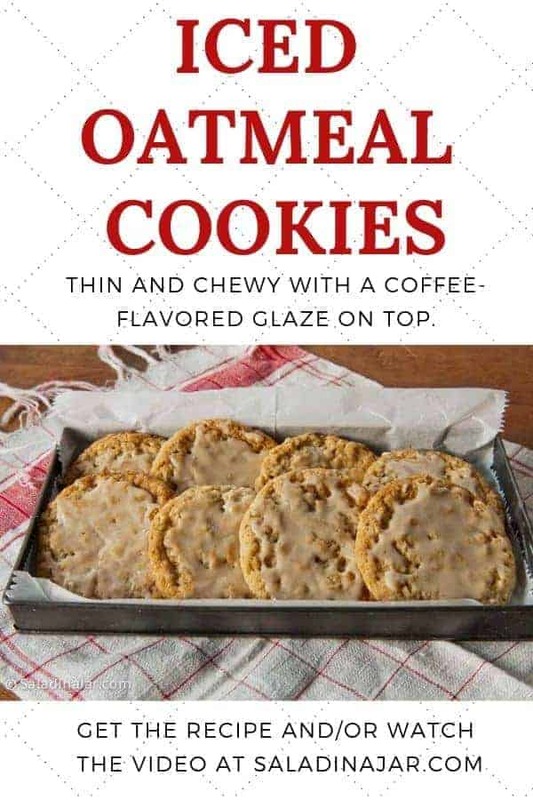 I’d love to try these cookies, but the oats that I bought are the ones to make breakfast, I think it’s the old-fashioned type. Do I have to pre-cook it, add them as they are, or what? The ingredient list calls for baking soda. But your instructions say baking POWDER. NO idea which I used!!!! Can you please set me straight on this? Many thanks for a great cookie recipe!! “Iced” cookies – now those harken back to cookies of old…. how wonderful. I must try some (sometime)… these look so wonderfully classic – and delicious! You are into oatmeal, smart lady. These cookies look so good, I think, I should bake them. These look amazing, I know what I am doing this Saturday 🙂 Tyler’s gonna LOVE them! 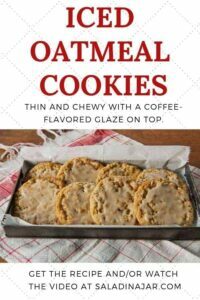 I have been on an oatmeal cookie quest lately, and I definitely want to try these oatmeal cookies. I think maybe I’ll have to frost 1/2 with the coffee glaze and the other 1/2 with the browned butter glaze — just to be sure I’ve tried all of the options. I had to laugh about your hubs and the thumbprints. They’re my all-time favorite cookie, too, and I could never understand why my mom only made them at Christmas. Well, one of the first things I did when I moved into my college apartment was to make a batch of thumbprints in October. You know what? They didn’t taste as good. Now I’m convinced that there’s something about the Christmas season that makes thumbprints taste better. I love oatmeal cookies. I usually add raisins, but never thought to ice them instead. Love the first photo! I LOVE a good oatmeal cookie! Icing? I’d not thought of that! Mmm! Shocked?? LOL. Chocolate would be totally awesome on these cookies. I have another oatmeal cookie recipe to which I add chocolate chips but I like this one better. I’m going to try chocolate icing the next time I make these. I adore oatmeal cookies. These look absolutely delicious! Looks delicious! I can have these anytime with a cup of hot mocha. Love the coffee icing. I agree. When I think of my recipes of yours……….it’s always iced cookies. I don’t know if that says more about you or me. I really love cookies. You made a cookie one time that I still think about. It had orange zest. Not sure if the orange was in the cookie or icing, but I remember coming home and trying to duplicate it. these are always a hit! you are right, they go fast!